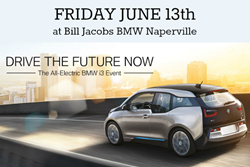 Bill Jacobs BMW in Naperville is excited to announce they will be hosting a second BMW i3 test drive event on Friday, June 13th at their Naperville dealership. Registration is open now, and slots are limited for this exclusive one-day “Drive the Future Now” event. The i3 is the first all-electric luxury vehicle of its kind, and we are excited to welcome everyone back to try this innovative Ultimate Driving Machine before it hits the showroom floor later this spring. Bill Jacobs BMW in Naperville is excited to announce they will be hosting a second BMW i3 test drive event on Friday, June 13th at their Naperville dealership. Registration is open now, and slots are limited for this exclusive one-day “Drive the Future Now” event. Those interested in taking the All-Electric BMW i3 for a test drive can register online here to reserve a spot. Bill Jacobs BMW was the first BMW dealership in the Midwest to display the New All-Electric BMW i3 in January of this year at their exclusive Electric and Electrifying Test Drive Event. It was so successful that Bill Jacobs BMW wants to provide another opportunity for eagerly awaiting customers to try out this groundbreaking new vehicle before it is available for sale later this spring. The BMW i3 is geared at redefining urban mobility. With its visionary design, the BMW i3 is the automobile of tomorrow. It is not only emission-free, but also offers an incomparable and nearly silent driving experience. The intelligent BMW ConnectedDrive Services in the i3 bring drivers to their destination with comfort and ease. The innovative architecture of the BMW i3 uses high-quality, sustainable materials, like strong, yet lightweight carbon fiber body. The aerodynamic exterior design of the BMW i3 features opposing doors, the characteristic black belt and large wheels, which all create a dynamic impression about the BMW i3's driving agility even when it's standing still. Starting at approximately $41,350 without freight & handling, taxes & fees and before federal tax credit.